Relating to something which is suitable to be used by people for food and so it is eatable: There are many esculent kinds of nutritious substances available for human consumption or drinking and ingesting. © ALL rights are reserved. 1. The swallow that makes the edible bird's-nest. 2. The nest of a small swallow, or bird, of China and the neighboring countries which is mixed with soups. A tall coarse annual of Old World tropics widely cultivated in the southern United States and West Indies for its long mucilaginous green pods used as basis for soups and stews: Hibiscus esculentus include okra, gumbo, okra plant, and lady's finger or a small finger-shaped sponge cake. 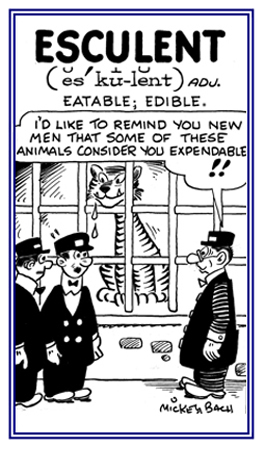 A reference to being inedible or not for eating. An edible species of the family ranidae, occurring in europe and used extensively in biomedical research. Commonly referred to as "edible frog". A well-known high-flavored juicy fruit, containing one or two seeds in a hard almond-like endocarp or stone; also, the tree which bears it (Prunus, or Amygdalus Persica). In the wild stock, the fruit is hard and inedible. Related "eat, eating" word units: brycho-; esophago-; glutto-; phago-; vor-. Cross references of word families that are related directly, or indirectly, to: "food, nutrition, nourishment": alimento-; broma-; carno-; cibo-; sitio-; tropho-; Eating Crawling Snacks; Eating: Carnivorous-Plant "Pets"; Eating: Folivory or Leaf Eaters; Eating: Omnivorous.